Wrapping a pork loin in foil before baking helps keep it from drying out as it cooks. Pork loin comes from the top of the leg to the shoulder of a pig and can be either boneless or bone-in, although the boneless variety, rolled or tied, is what you're likely to find at the grocery store. Covering the pork loin entirely in aluminum foil prevents its natural moisture from escaping into the heat of the oven. You can also add vegetables and created a foil packet, allowing the vegetables to cook in the flavorful steam that the baking pork loin creates. Preheat the oven to 350 degrees Fahrenheit. 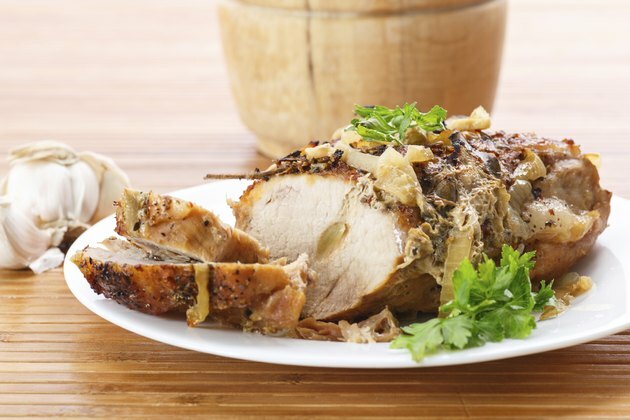 Season the pork loin generously with salt, pepper and your favorite fresh herbs. Rosemary, thyme and oregano work well with pork. Cut two equal-sized squares of aluminum foil large enough to cover the pork loin with room to spare. Stack one sheet on top of the other and place the pork loin in the center of the foil. Add washed and chopped vegetables if you wish to cook them with the pork loin. Try whole garlic cloves, chopped onions, diced potatoes, green beans and diced carrots. Place the vegetables on top and around the pork. Bring the four sides of the aluminum foil sheets together over the pork loin to seal the packet, leaving some room to allow for steaming, especially if you included vegetables. Place the foil-covered pork loin in the oven on the center rack and cook it for about 20 minutes per pound. Check the internal temperature of the pork with an instant-read thermometer to make sure it has reached a minimum of 145 degrees Fahrenheit. If you included vegetables, they should be fork-tender. Remove the pork loin from the oven and allow it to rest for 10 to 15 minutes before slicing. If you want the pork loin to have some color and caramelization, sear the pork first in a hot skillet on all sides, before wrapping it in foil to finish cooking in the oven.